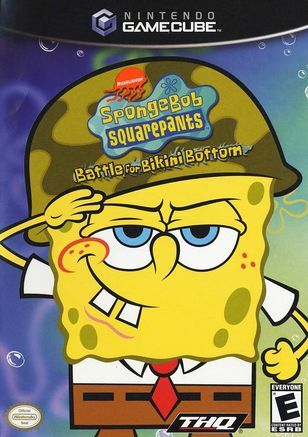 In an effort to cause the kind of global mayhem he has always dreamed of, the evil Plankton has set in motion his most diabolical plot ever to take over the world in SpongeBob SquarePants: Battle for Bikini Bottom . The fate of Bikini Bottom has been put in the hands (or small tentacles) of three unsuspecting heroes. 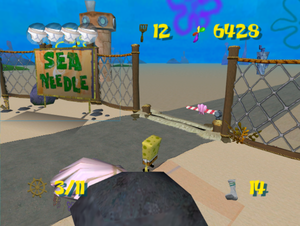 Put your platform skills to the test as SpongeBob, Patrick, or Sandy Cheeks, with an array of insane new maneuvers and power-ups at your disposal. Explore a huge 3D world, encounter familiar friends, and finally put an end to Plankton's evil scheme. Translucent red flat planes appear on the ground in many areas. This minor graphical glitch doesn't affect game play. This effect can be fixed by disabling Scaled EFB Copy. The outline of a box appears over the upper left corner of the screen /w IR >1x. Prior to Hybrid XFB in 5.0-5874 XFB Real must be enabled to remove it at IR 1x. The Widescreen Hack has clipping issues in this game that can be fixed with a Gecko Code. 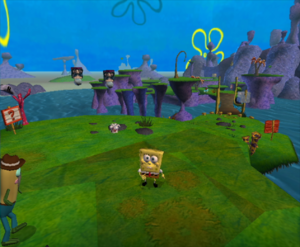 The graph below charts the compatibility with SpongeBob SquarePants: Battle for Bikini Bottom since Dolphin's 2.0 release, listing revisions only where a compatibility change occurred. 5.0 Windows 10 Intel Core i5 3470 NVIDIA GeForce GTX 970 Runs perfectly at 1080p. Enable real external frame buffer to remove the blue box and disable Scaled EFB Copy to fix the red triangles MISSINGNO. This page was last edited on 18 March 2019, at 08:29.